Year-end refers to the date that your company’s financial year comes to an end. Not to be confused with your Tax Year which runs from April to April in the UK, your companies’ financial year can begin and end whenever you like and will be determined by you. Running year end in Sage Financials is a simple and straight forward process, which literally involves clicking a few buttons. All of the hard work is done by the system. This process will lock this financial year and ensure that you are unable to make any more postings to it. Hint – You can post transactions to the new financial year before closing off the previous one. Q: When should I run my year end? A: You can run your year-end process whenever you like! It doesn’t need to be on the last day of your financial year, as long as all of your checks are complete and all journals and transactions belonging to that financial year have been posted then you are ready to run the process. Q: What checks do I need to make in preparation for running my year end? It is generally recommended that you check with an accountant to ensure that any checks specific to your business have been completed before closing off your financial year. Check that all transactions and journals are posted and be sure to allocate as much as possible! Revalue bank accounts where foreign balances are applicable. Q: Can I undo the year end? A: Once you have completed the year end process you will be unable to post any journals or transactions into that year. So you forgot to post an invoice? You can undo the year end closer, with the exception of France and German legislations where this process is final. It may be also worth noting that you cannot undo year end if the year succeeding is closed. Click on Configuration and navigate to the Companies subtab. Click the drop-down next to the company you wish to reverse the year end for, select Adjustment Process. Check the year in the top right corner is the year you wish to revert. At the bottom of the page select Revert next to Finalise your year end. If you need to post an invoice into a specific period you will need to navigate back to Configuration > Companies, select the company. Under the Periods related list select View All, select the period you wish to re-open e.g Period_2018_11, click Edit and change the status to Open. Q: Who can run the year end process? A: Any user may complete the year end process in Sage Financials regardless of their permissions. Q: How long does it take to run the year end process? A: Closing off your financial year is a relatively quick and straightforward process, running year end should take only a few minutes max! The time-consuming bit is usually the preparation rather than the process itself. Q: Can anything go wrong during this process? A: Providing all checks have been followed, your year end closure should be a straight forward process. If you are unsure of anything you can always undo the process, make any necessary changes and re-run the closure. And of course, our support team are always on hand worst case scenario! Hint: Why not create a year-end countdown? You can assign certain tasks with certain deadlines to members of your team. Ensuring that you work together to make the preparation process as streamlined as possible. With the help of this blog, running your year end process in Sage Financials should be a straightforward and stress-free experience! 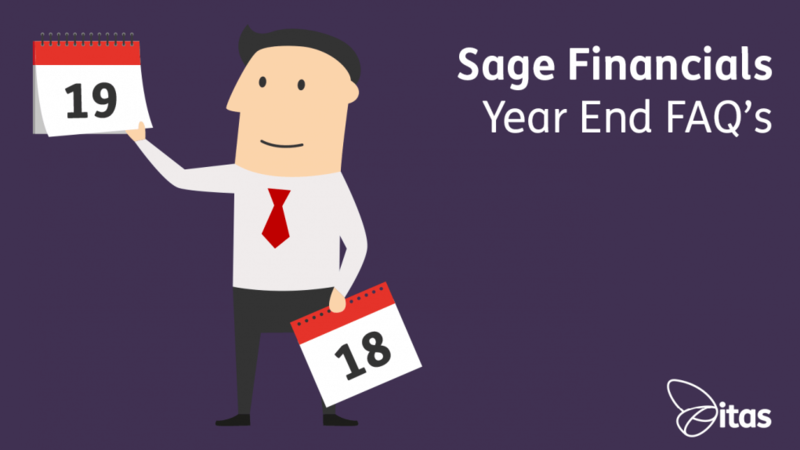 If this blog doesn’t answer all of your burning questions please take a look at another blog of ours ‘Running your Year End Smoothly with Sage Financials’ or contact our support team for more information.